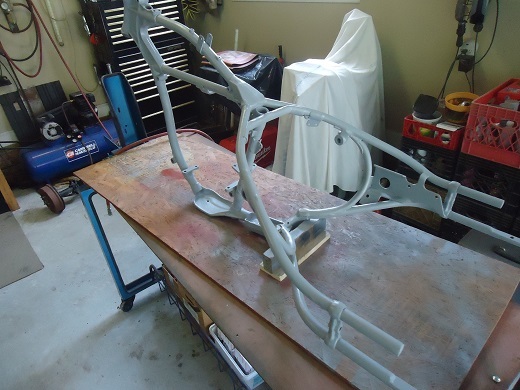 Frame preparation was the first step of the 1961 Harley Servi-car restoration. This included inspection, old paint removal, priming, and painting. Inspection is crucial, not only for safety, but for component fitment as well. 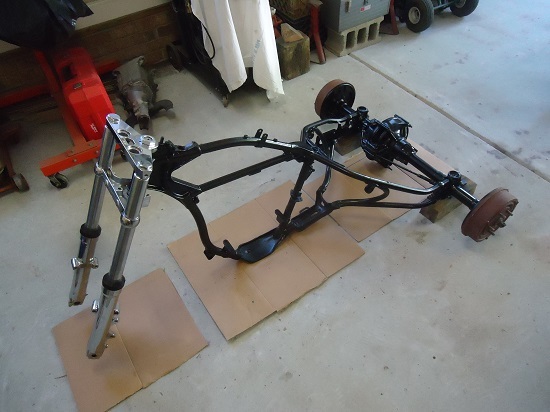 Over the course of it's 41 years in production, the Servi-car frame received several major and minor changes. Double-check that the components you will be using will fit before painting and final assembly. Improvements to Harley's Big-twins often appeared on the three-wheel Servi-car. 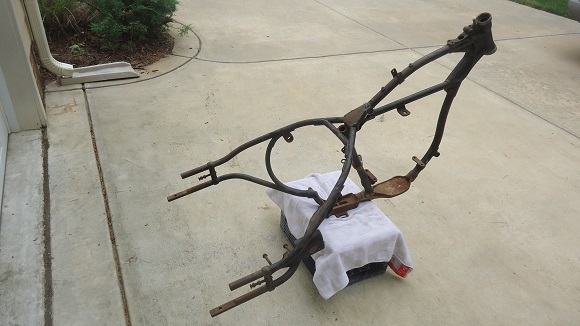 A stronger, redesigned Knucklehead frame in early 1940s carried over to the Servi-car frame. 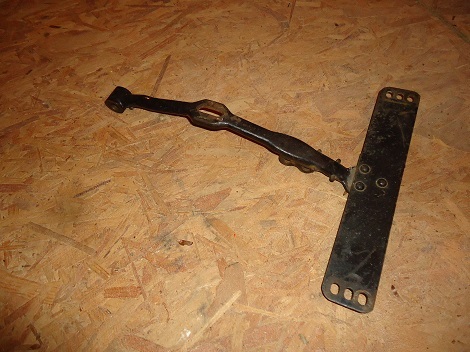 A steering damper peg and a welded-on horn bracket appeared in the late 1940s. Servi frames up to about 1963 have a frame-post mounted battery box. Other differences over the years include slightly different clutch cable mounts. Early Servi-cars (1932-1950) have mechanical brakes in the rear and no master cylinder was required. Starting in 1951, hydraulic brakes were fitted which required a master cylinder. 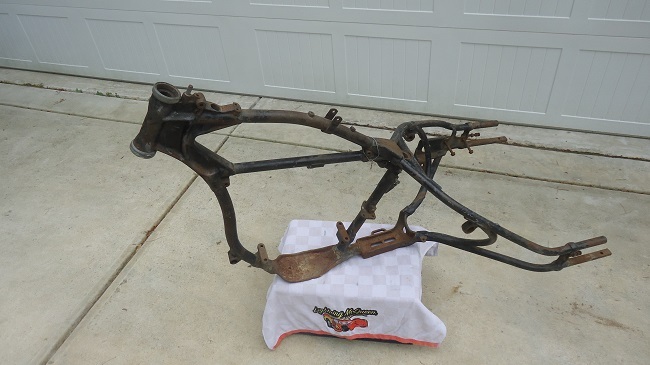 The later Servi-car frames have a m/c bracket located between the lower-right rear frame tube to upper-right rear frame tube, just in front of the rear axle adjuster bolt. Early Harley-Davidson trikes (1932 through 1957) have a springer-style front end with a neck cup size of 7/8". In 1958, when Panheads went to hydraulic front forks, so did Servi-cars. 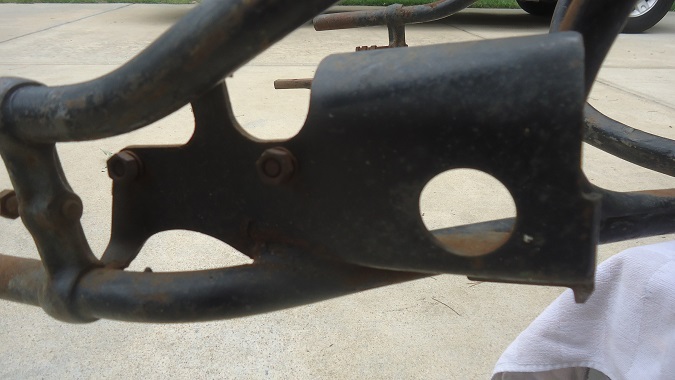 These 1958 and later frames have a slightly taller steering head and there is a bulge at the end. Neck cup size is 1". 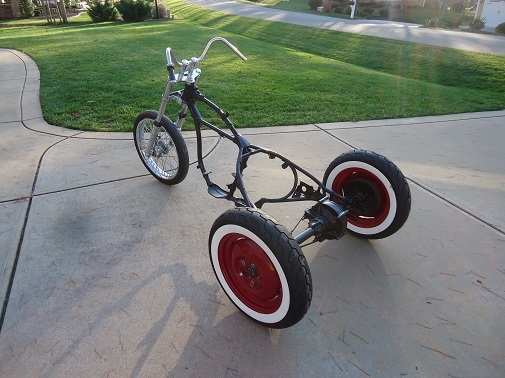 Inspect the frame closely for cracks, bent tubes, and damaged or missing mounts and brackets. A framing square can be used to check tube straightness. A simple way to check for frame straightness is take two pieces of wood (like broomsticks) and place one in the neck tube and the other in the seat-post tube. Stand back from the frame a few feet and see if the two sticks line up straight or if one piece of wood leans to one side. The key to every good paint job is in the preparation. Before stripping the old paint off, clean the surface with mineral spirits. If you will be re-using the neck cups, mask them off with painters tape. For paint removal, I used an electric grinder on the bottom of the frame then switched to paint removal flap discs. After stripping down to bare metal, I hand-sanded any hard to reach spots and thoroughly cleaned before applying primer. 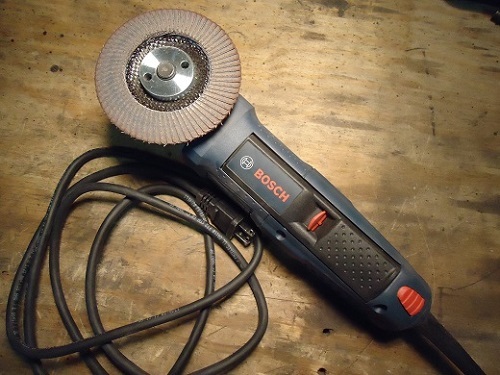 If you're painting bare metal, you need to protect it against moisture and rust. A metal paint primer is needed here. If the metal is not primed, water can seep in and oxidation will start. If you are spraying over old paint, then primer may not be needed. After letting the primer dry for several days, I inspected the frame carefully, then lightly scuffed the frame and applied several coats of semi-gloss black. I let the paint sit for over a week before starting to re-assemble. 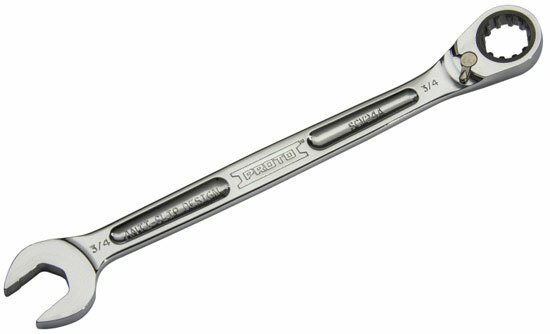 On 45" solo bikes and Servi-cars from 1930 to 1973, the seat post diameter is 1.06" (bushing ID 1.065"). This smaller seat post also fits 1982 to 1984 FLH four-speeds, but not the five-speed FLT or FLHT. There are slight variations in the seat bracket but they interchange. Pictured below is an early style. There were no VIN numbers on a Servi-car frame until the 1970 model year. Up until 1969, the only VIN number is on the engine, located on the left case. Engine VIN numbers usually started at 1000 each new year, but Harley-Davidson didn't necessarily assemble machines in numerical (serial number) order. an engine could have been held back for one reason or another. So, it's possible that an engine with a numerically lower VIN number may have reached the final assembly line after an engine which had a numerically higher VIN number. Starting in 1970, all Harley-Davidson models had VIN #s on both the right-hand engine case and the frame. 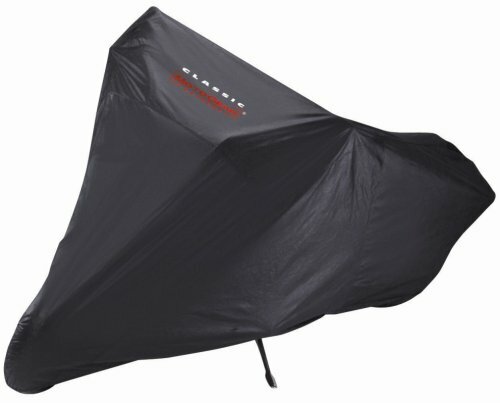 Beware of buying a 1970 or later Harley motor with no frame and registering it with the engine's VIN. It isn't going to be the true Harley title. 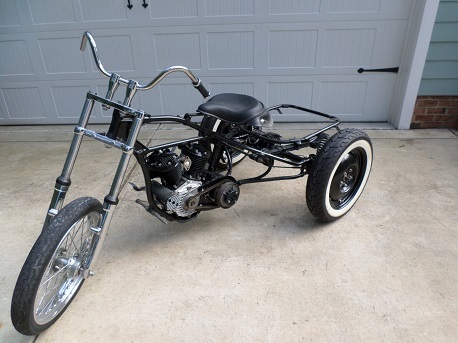 Another person may be riding around in the frame with a different or aftermarket motor, and that bike is correctly titled off the frame number. If you get stopped and they run your VIN number, your bike gets impounded because there's another bike out there that is correctly registered with the same VIN.